Despite all the bad news - solar companies winding up, unrealistic subsidies in China, etc - the demand for solar PV energy in other parts of the world is expected to grow at explosive growth. Now that is optimistic but given the current momentum, and the benefits of going into renewable energy, this idea should be supported. Latin America reminds me of the initiative by the Brazil government to power up its stadiums used to stage the football 2014 World Cup, using solar photovoltaic. 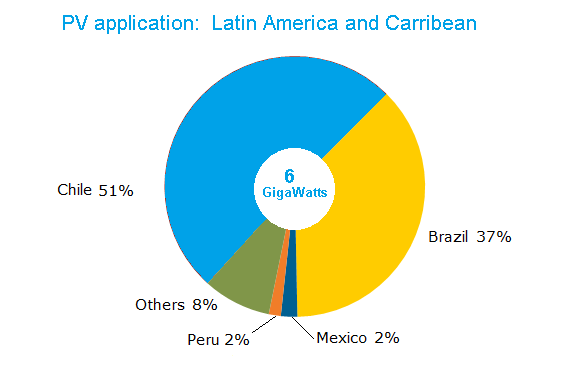 Solarbuzz reported that demand for solar photovoltaic (PV) energy across Latin America and the Caribbean is poised for explosive growth through 2017, with a forecasted compound annual growth rate (CAGR) of 45%, according to the new NPD Solarbuzz Emerging PV Markets Report: Latin America & Caribbean. Historically, PV demand was confined to rural off-grid and niche applications, but new renewable energy policies and incentive programs are now opening up the region for strong PV deployment. Set against a backdrop of strong economic growth, expanding energy demand, and increasing electricity prices, the conditions for PV adoption appear particularly attractive. Mexico, Chile, and Brazil are emerging as market leaders within the region, driven by a combination of net-metering, Renewable Portfolio Standards (RPS), and other policies. These three countries are forecast to have almost 70% of PV demand within the region by 2017. By the end of 2012, energy regulators across the region will have received PV project applications in excess of 6 gigawatts (GW), stimulating a healthy pipeline of new opportunities for PV component suppliers, developers and installers. difahamkan beberapa stadium yg digunakan dlm 2014 World Cup (termasuk yg sya sebutkan dlm artikel ini)akan dikuasakan dgn tenaga solar. What's for dinner: Zimbabwe's mopane worms! Dual-screen YotaPhone: Would you use it? Which is better: Green tea or your breakfast tea? When will humans stop breaking Olympic records?